. إن الخدمات الممتازة وحسن الضيافة العالي في DoubleTree by Hilton Hotel Darwin تجعل إقامتك تجربة لا تنسى. يقدم هذا الفندق العديد من الخدمات الكفيلة بإرضاء أكثر الضيوف تطلباً. في DoubleTree by Hilton Hotel Darwin غرف نوم يزيد عددها عن 184 صممت بذوق وعناية لتوفر لك كل وسائل الراحة . بعضها يحتوي أضاً على تلفزيون بشاشة مسطحة, اتصال لاسلكي بالإنترنت, اتصال لاسلكي بشبكة الإنترنت (مجاني), غرف لغير المدخنين, مكيف هواء. يمكنك طلب اللائحة الكاملة للخدمات في الفندق ومن بينها مسار جولف - ضمن 3 كم, حمام سباحة خارجي, حديقة. إن DoubleTree by Hilton Hotel Darwin هو خيارك لخدمة الفنادق الراقية في داروين. Stay was fine and staff really friendly. For the price they should really include free wireless internet rather than charge quite a lot extra for this. Also there is no gym, but you can use the gym in the hotel next door (also a double Tree Hotel) for free. The location right on the Esplanade is the real draw-card for this hotel. I would stay here again, they should just reduce their prices a little in my opinion to match the more limited services provided. Lovely hotel with pleasant and helpful staff. Excellent location as not far to walk to the centre of town. If you want a quiet room,make sure you have a room facing the Esplanade as the back faces Mitchell St. which is pretty wild on there week ends. 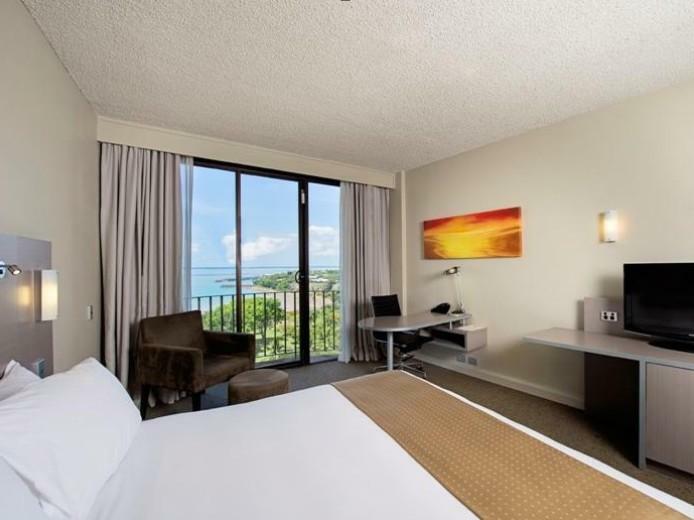 Lovely hotel, great staff, prime location looking over Darwin Harbour. You can't go wrong. Recommend this hotel for travellers to Darwin. I was assigned a room with a beautiful view of the harbor, simply amazing. Staff are friendly and helpful. Location is excellent, walkable distance to The Mall, Darwin Waterfront, and Cullen Bay. Stones throw to Mitchell Street where there is an abundance of food and drink, and even a Coles supermarket. Recommend renting a car to get around as taxi fares are a bit on the high side. The apartment was a good size with all the amenities that you would need. Free wifi was excellent. Would have liked a higher floor but apparently booking through Agoda was for a basic room only. No free upgrade to a higher floor offered without charge - the only difference was a potential view over the trees to the water. Front of house staff very friendly and happy to book the shuttle to the airport when asked. Will probably return. comfort , location , excellent staff. It was awesome - right from check in the receptionist was so friendly and helpful all the way through to check out ! The bed was amazing , the view spectacular and location right near all the bars and restaurants. the only thing I could fault was there was no compendium in the room so we didn't know if we could order room service or not ? Breakfast was great , though the coffee machine was crap ! I requested late checkout and was thrilled when we were offered a 3pm check out . we will be back ! During the first stay we had requested for connecting rooms with the kids but the request was not fulfilled though the checkin staff worked hard to find us rooms on the same floor. We then requested again for connecting rooms for our upcoming second stay at the hotel and was assured that they would register the request for our next stay 10 days later. When we returned for our second stay 10 days later we were informed that due to over-booking we did not have a room at the hotel at all. We were left helpless with no choice but to accept the unwelcomed alternative of being put into an unknown apartment hotel in a different part of town. We did not receive an equivalent accommodation and no acceptable explanation why we had our rooms cancelled without notice, especially as we had reminded the hotel of our second booking during our first stay. i would never stay there again and i ill never stay in a Double Tree facility ever again. Telephones in the room did not work when we arrived. We were told that this as because the whole hotel was in the same position. Want room service? Want an early wake up call? Not exactly 'out of the box' needs for travellers. But unless you want to get into the lift to arrange these, you use your cell phone (international Singapore number) to call the reception like an external caller. And then 'wake up calls' were knocks at your door - hot to call a phone in room that did not work? Room service was awful. Ordered twice. Over the two experiences the food was 70% abandoned. Easy food to ook that was ill prepared each time... not good at all. Room service charges on one occasion totally waived as made international phone call to complain without going back downstairs (no phones in room). Who orders food to have the bill wived and send it all back? That's not service - that's just skipping dinner. Outside in an adjacent park is lovely. Until there are aboriginals that are hell bent on being raucous, getting drunk and so noisy you can hear them in the middle of the night arguing and shouting. Aus 27 dollars per day for basic internet access that even counts the megabytes you download is extortion. The 2 hour rate is no cheaper value wise Especially when the connection is up / down / up/ down whilst all this recalculating of capacity and usage is going on. If i was only using a mobile phone as the device for access, then an international phone roaming subscription rate from Singapore is cheaper. Go figure. After a while, there's only so many times a guest wants to go complain and to do so, make an international phone call or go downstairs to a lobby. And after a stay of 8 days the hotel "was trying" to fix the in-house phones. Still. What a joke. Great view of the ocean. The room was very clean, plenty of room. Very kind staff. We stayed here for our honeymoon. Our room was facing the ocean. The ocean spread out in front of you. Our room was big, clean and quiet. Also staff there are all very friendly and kind. 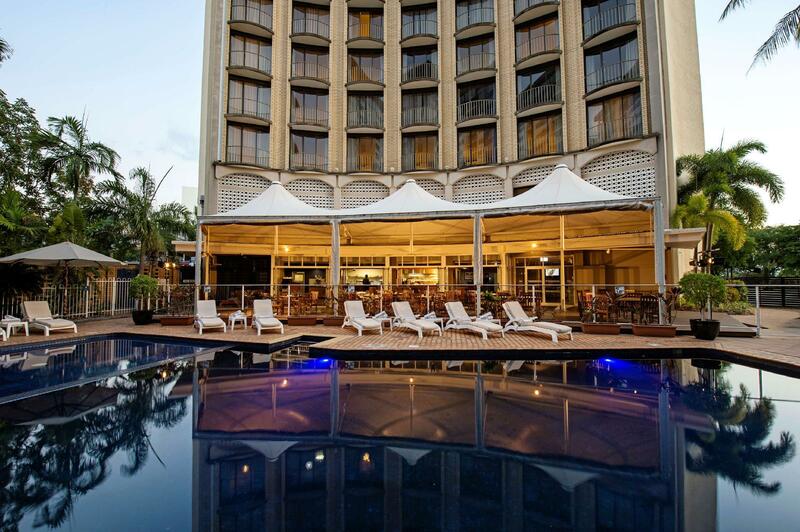 We would definitely recommend this hotel to anyone visiting Darwin. The stay was pleasant, rooms recently renovated inside, but hallways and foyers were in need of renovation. The restaurant was expensive for size/type of meals, and definitely not one to rely on for the whole stay. Front foyer staff were extremely helpful and friendly, nothing was too much trouble. Would stay here again. We liked Doubltree service and facilities at Times Square, NY, and Darwin same standard of quality bedding, cleanliness and good staff. I just hope that Agoda is fast putting through my Velocity points for the booking....would end a good trip overall. Overall the hotel was good and we would stay there again, but hopefully the bathrooms would have been brought up to scratch as they are now very dated & in need of modernisation, also wifi should be available to the rooms free of charge not just for 15 mins in the lobby. Really nice hotel that is close to most of the entertainment and restaurants in the area. Room was nice and clean and all of the furnishings in the room were quite nice. The beds were comfortable and the help at the front desk was spot on. Would definitely recommend this hotel to friends and family. The room was a good size and very comfortable. Could not fault the staff - very efficient. Bathroom could have done with some minor repairs. Pleasant to hear Church bells ringing on the Sunday we were there - not something you hear too often nowadays. we had a lovely spacious room. Really appreciated the laundry facilities in the hotel. Convenient and clean! Staff were friendly and helpful. The hotel is within easy walking distance of shops and sites. Loved the park! Enjoyed the restaurant, the menu was limited, but they were happy to let us share our choices. The bar is a nice place to relax. Big room, very clean and the service was excellent! We really enjoyed staying here. Everyone was very courteous and professional. Great room with lots of space.. Only problem we had, there was no place to hang your wet clothes after using the pool. There was a clothes line in the shower but the clothes took ages to dry. Besides that, we would go back!